I’m a line-in sorta guy. I would never call myself an audiophile (on principle) but I do know good sound when I hear it. 2 That’s as far as I can confidently claim “expertise” on that subject. 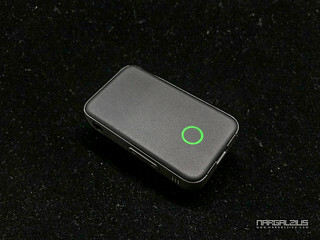 So for me, if a wireless technology can get close to a line-in sound, then I’m a happy camper. A lot of BT products have claimed that in the past (and continue to do so) – but the reality is that going from line-in to BT (especially in a portable setup) most of the time is like going from line-in to radio. The problem is a lot of companies focus on the more “pedestrian” features such as having booming bass. They never really focus on balance, separation, and clarity. 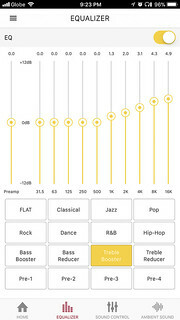 Granted, it could be argued that asking for studio grade quality is pointless in a mobile scenario where the environment constantly changes – but with the advent of noise canceling headphones and IEMs, 3 In Ear Monitors common folk now have access to pretty good sound isolation where the audio you’re listening to can now take center stage wherever you are. 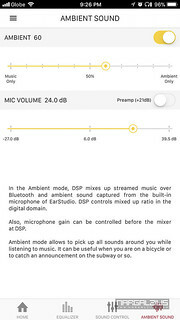 While the BT standard can certainly handle enough audio throughput to support lossless (or extremely high quality audio at the very least) the bottleneck has always been in the quality of their DACs 4 (Digital to Analog Converters – and for some reason, 5 although it’s highly possible that it’s simply because I have never been doing my due diligence a reasonably priced/portable BT receiver that can deliver good sound is quite elusive. 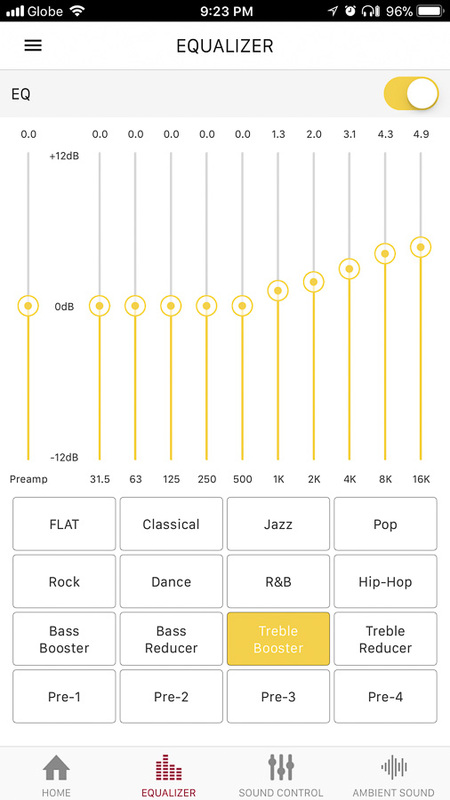 To be fair, I had purchased a Jabra Clipper years ago – and was quite happy with its performance (although only intended to use it for running then) – the only major issue was it had too much bass (which I guess most people like) and couldn’t be adjusted. Nevertheless, it was one of the few decent receivers that allowed me to use my own headphones. 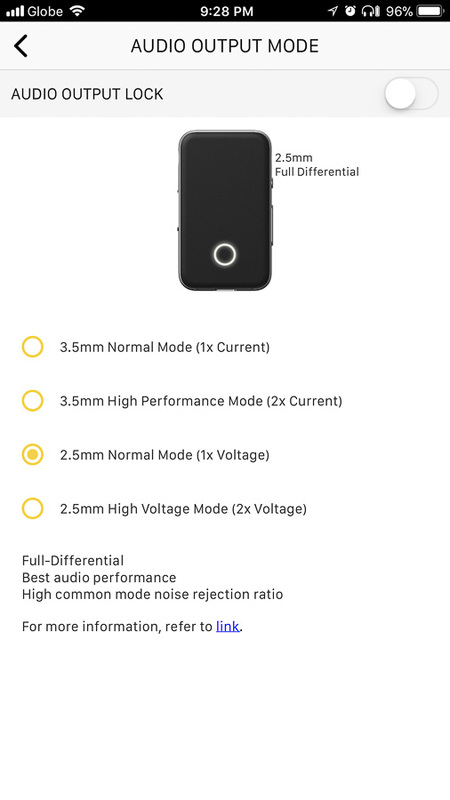 As an aside, checking their site right now, they have no model that does what the Clipper did – either they have headsets that have their own built-in earphones, or actual speakers. I wonder why they didn’t continue the receiver-only line. But getting back on topic… you get the point – the same goes for car audio – but I digress. 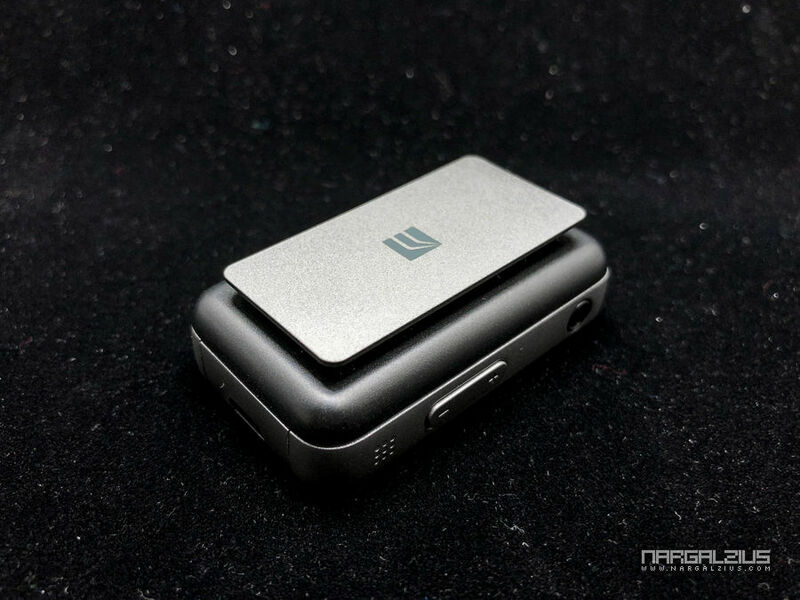 What I needed was a modern replacement for my Clipper – and the Radsone EarStudio ES100 showed lots of promise. So the gist is that this is supposedly able to output 88.2kHz/24-bit sound, supporting lossless audio though the BT protocol. Of course it would ultimately depend on what actual codec(s) it supports (more on this later), but as far as hardware goes, it seemed more than capable. The box out of the post office was pretty banged up, but thankfully it was just cosmetics – the foam molding inside provided adequate protection. The package contained three things: The ES100 unit, a micro USB charging cable, and a 2.5mm TRRS balanced cable – which was an optional add-on I purchased. The unit is extremely light; made entirely out of plastic – but the finishing on it was impressive – it didn’t look plasticky. The rear had a clip which is pretty much par for the course – but far easier to use than the Clipper’s – so that was a plus. 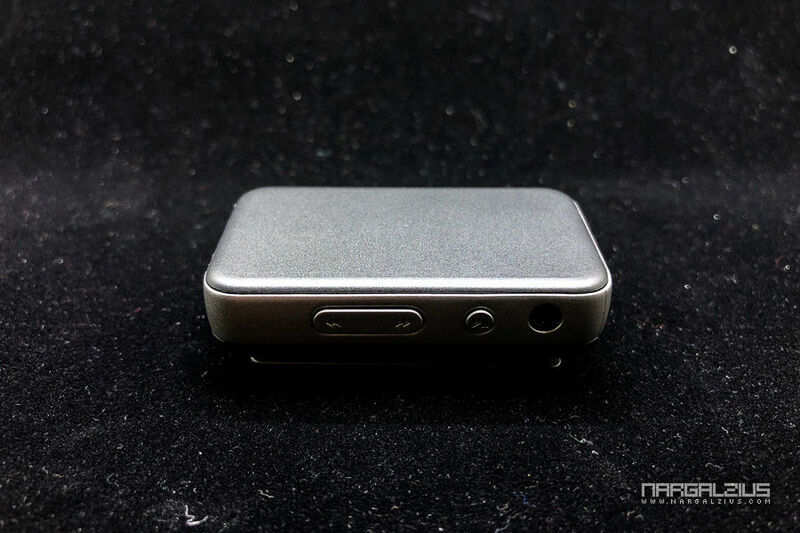 You can also see the 3.5 headphone jack and the volume controls on the sides. Powering up the thing enables a single multicolor LED embedded beneath the translucent surface – which I have to say, looks extremely elegant. The startup/shutdown tone however could’ve been more “professional” like just a couple of ascending descending beeps – instead they went with a chime sound which quite frankly reminds me of cheap Chinese electronics. I’m nitpicking obviously 😛 Besides, it could’ve been worse – like some talking female with a janky accent. As you may have noticed from the previous picture, it is pretty small. 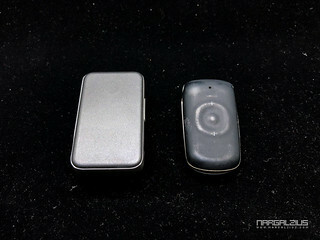 Below you can see it compared to my old Jabra Clipper. Considering it has much larger (and stylish) LED, an added dedicated output jack, and I’m assuming a larger battery – not bad at all! 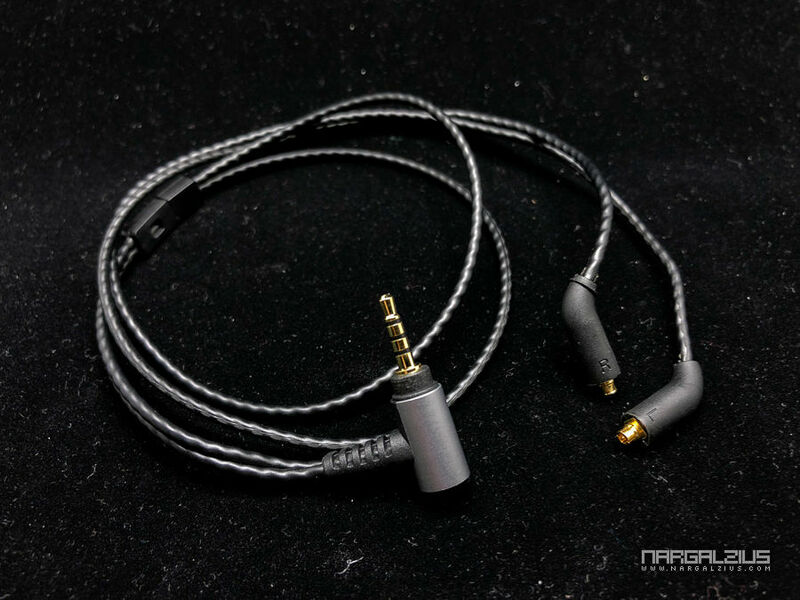 Using it with the much shorter 2.5mm cable allows me to store it with my IEMs connected to it – making it a breeze for busting out and storing. 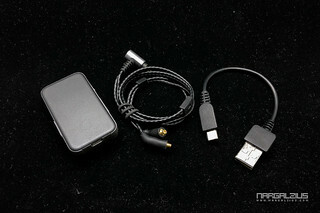 And of course, it’s very neat when worn because of the minimal cable length. They definitely sound better than the Jabra. I wouldn’t necessarily say they sound the same had I plugged directly into the phone, but it’s pretty close. It’s also worth mentioning that I’m using an iPhone, so AFAIK the output is not utilizing the full capabilities of the ES100. AirPlay requires WiFi so I don’t think Apple actually has a BT counterpart for lossless audio, unlike Android’s aptX. They obviously got their AirPods which run on BT 4.1, but I don’t think they opened up the protocol for other manufacturers to integrate into 3rd party products – and I’m not even sure if it’s even doing lossless audio, at that. I would like to try this with an Android device and see how much of a difference using aptX with it would be. Probably the most useful feature. Being able to adjust frequencies is always a good thing – so this alone already blows my old Clipper (and possibly most receivers) out of the water. I like it especially because it allows me to tune the ES100 to the particular phones I’m using it with. So for example, my FlipEars Alpha Greens have a relatively early rolloff on the highs, so I can tweak those back in for a more balanced sound. Then when i switch to my UE IERMs – I could just set it flat. Or when I use my IE40’s, I could dial down the lows and highs a bit. I can basically dial in my headphone sound without having to tweak anything from the actual source device. The jury’s out on how useful this exactly is. It sounds (pun not intended) like a good idea especially for those of us who use IEMs which tend to completely block out all other sounds around us. 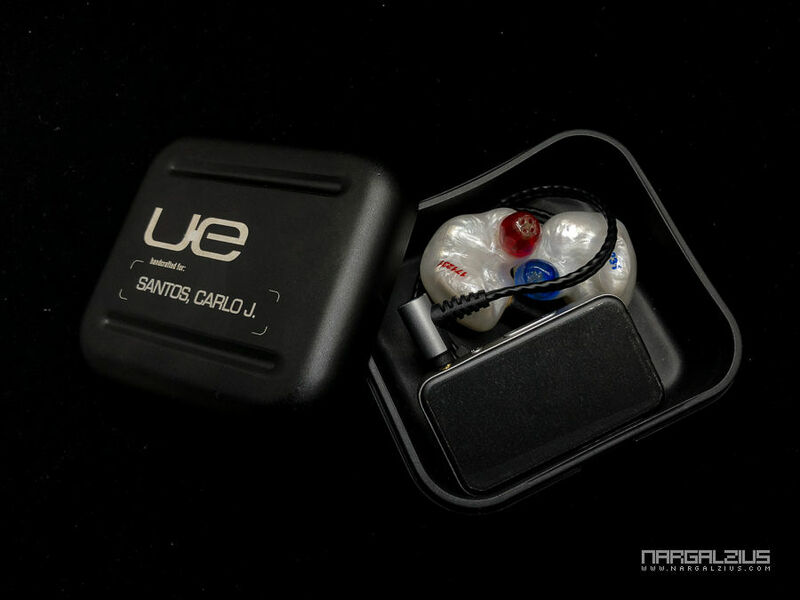 Even more so with some of us that use IEMs that are custom fit to our ear canals – because it can get tedious to have to remove them whenever someone wants to talk to us, then put them back in. So having a way to just let the sound in when needed is certainly useful. Luckily the ES100 has a microphone – so not only can it be used for hands free calls, but the mic can also be used to allow external sound to pass through and mix with your jam. Why is the jury out on this you may ask? Because it only activates while sound is playing on your device (whether it be music or system sounds) – after which it disables itself. 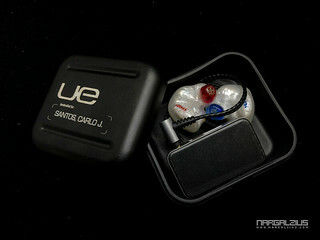 The sound isolation provided by custom IEMs are equivalent to legitimate earplugs, so I’d still have to take them off if someone happens to talk to me while nothing is playing. Also, it’s a fully on or off sort of deal – there’s no noise gate, limiter, or any sort of threshold algorithm. 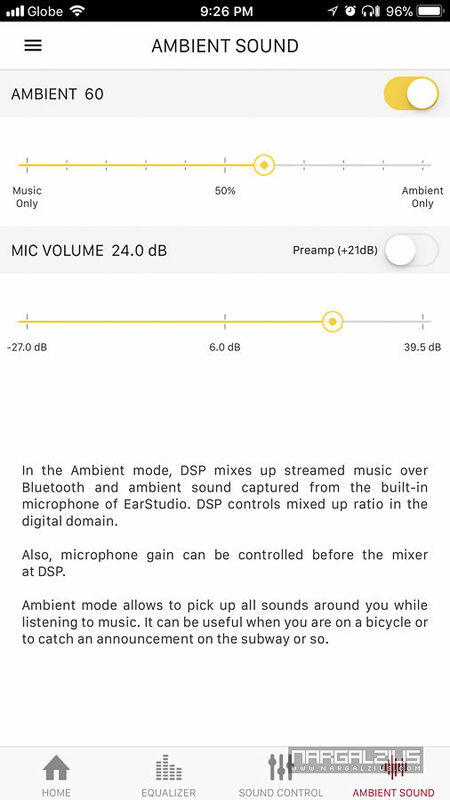 So for you to hear someone properly you’d have to set it at a level that basically literally lets you hear the ambient sound as well all the time it’s on with your music – which defeats the purpose of having sound isolating earphones. While you think it’s just a matter of turning it on or off as needed – you’d be right. However you’d always have to dig into the app to do it – which is not as quick and efficient as you think it is. It would be nice for them to put a widget on the iOS lock screen to switch it on/off – then it would be much more usable then – but as it is, it’s just not practical to use unless you can anticipate when you’ll actually need it to be on. Oh and I forgot to mention that it’s got a considerable amount of latency – so you’ll find yourself a bit distracted by the delay when trying to converse through it. 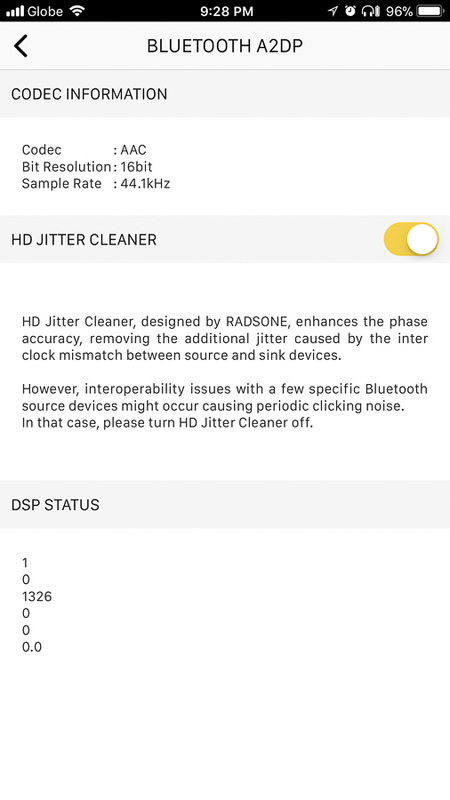 There are other “proprietary” algorithms they employ such as “Distinctive Clear Technology” and Jitter Correction, both of which, quite frankly are imperceptible regardless of settings – but again, perhaps it’s because my source isn’t utilizing the full bandwidth of the device. Or maybe I just have lousy ears – so take this with a grain of salt. 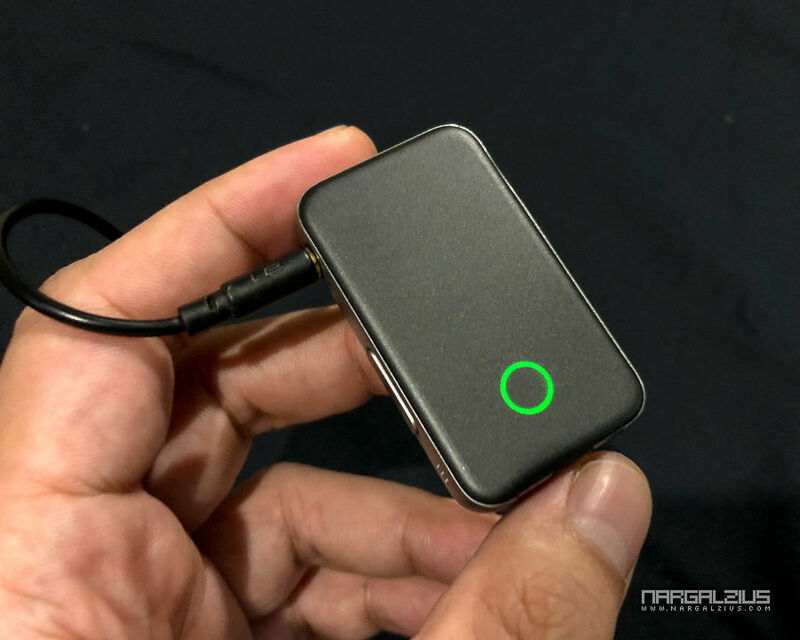 It even allows you to manipulate the actual voltage/current driving your headphones… which personally I feel is unnecessary – and awfully dangerous unless you know what you’re doing. Then again, it means that you’ll have no problems driving even high impedance earphones so perhaps it’s worth the risk. 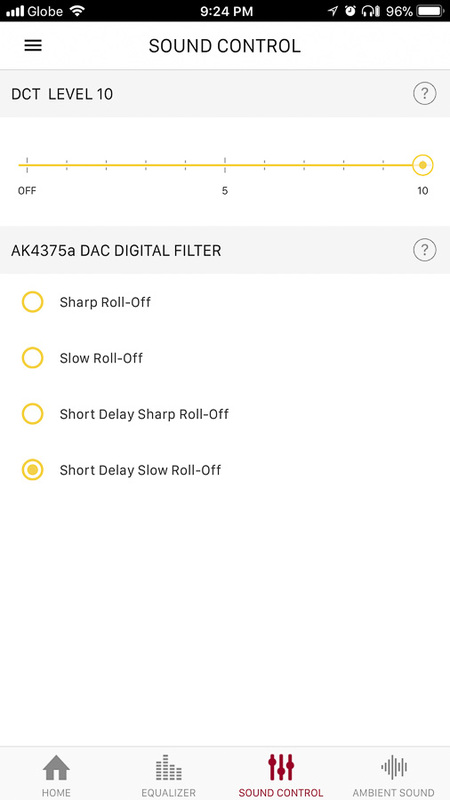 Lastly, you can also upgrade the firmware of the device – which is promising because I hope the support for better Apple codec performance is just a software thing – rather than requiring new hardware. I will subtract some points for the fact that you can only upgrade via Windows. Where’s the love for Unix users, right? I mean it’s just a commandline batch file in Windows, you mean to say they can’t just port it to a Terminal script? Or better yet, since they have a mobile app – why not allow the upgrade to be done from the app? Overall, I’m very pleased with the ES100. I think it’s well worth even at retail ($80) given how much quality and functionality is packed into this thing – and that’s from an Apple user. What more if you have an Android that can use it to its full potential. I really don’t use a point system in my reviews 7 Which is ironic since I keep on mentioning “taking points” here and there. But if I were to rate it on a scale of 1-10, I’d say it’s a solid 8. I don’t think anyone would be disappointed with this thing unless you have dog’s ears. 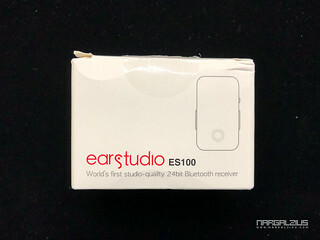 The ES100 as of this posting is not yet commercially available, but I would imagine you could purchase them at their site when available. 2. ⇡ That’s as far as I can confidently claim “expertise” on that subject. 7. ⇡ Which is ironic since I keep on mentioning “taking points” here and there.